The preseason is over, so what do we know about the Buffalo Bills? One thing is obvious, the 2017 version of the Buffalo Bills will not be anything like the 2016 team. The roster is drastically different and the team is playing an entirely different scheme on defense than it did the last two years. Add to that the fact this team might open up the regular season with a rookie starting quarterback who was drafted in the fifth round. There have been stories circulating around the internet that NFL teams like the Bills, the New York Jets and the Cleveland Browns may secretly want to “tank” the season so they can get a shot at some of the quarterbacks in next spring’s Draft. That thought is beyond laughable and won’t happen. One of the reasons is that it’s the draft media that are circulating these stories and reality is they have no clue what they are talking about. While next April the quarterback class may be good but it won’t be close to being as good as many of these analysts felt. We found that out first hand over the weekend. The fact is we won’t know how strong or weak it is until next January if that. With quarterbacks, interviews and private workouts go a long way into the final evaluation, not just the play we see on the field. Add to that the fact that Head Coach Sean McDermott and General Manager Brandon Beane have worked for years just to get the opportunity to run a football team. There is no way they are going to hurt their career by “tanking” a season. Looking at the Bills roster, there are plenty of new faces, in fact over thirty players on the roster now weren’t in Buffalo a year ago. As expected with a scheme change the majority of the new players are on defense especially at the linebacker and defensive back positions. New schemes mean the personnel department and coaching staff have to find players that fit the scheme. Many of the players on defense last year were not fits to play in McDermott’s 4-3 scheme. Even today as the roster has been “finalized” there are players that aren’t what we call good fits. This will be a work in progress over the course of this season and into next year with free agency and the Draft. While the Bills may be forced to start a rookie quarterback in the opener, I don’t think that is a bad thing. Nate Peterman may have been drafted in the fifth round but I felt all along that he was a late second or third round type player. Peterman showed in the preseason that he is a quick study and is capable of making good decisions. He has excellent intelligence to go along with good instincts. He has more upside than starter Tyrod Taylor and in my opinion it was just a matter of time before he became the starter. 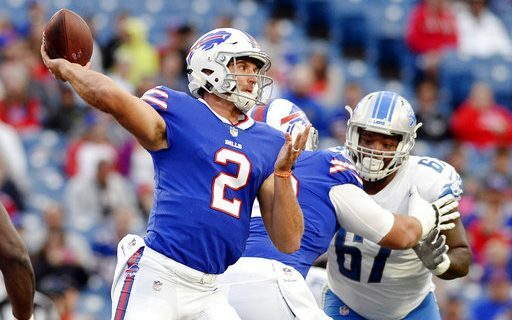 If in fact Peterman does start the game I fully expect that he will not relinquish that role when Taylor is ready to come back. The only thing that Taylor has on Peterman is experience. While that is a huge factor in the NFL, I don’t think it will matter once Peterman gets some regular season game time under his belt. Taylor struggled to throw from the pocket and is best when throwing on the run. That limits what Buffalo can do offensively. While Peterman doesn’t have the athleticism, speed and throw on the run skills that Taylor has, the rest of his game is more NFL like. It’s my belief that all he needs is experience before becoming a winning NFL quarterback. He may not be the type to get a team to a Super Bowl, but he sure as hell can get a team to the playoffs! One thing I expect from this Bills team is that they will be aggressive and competitive on every down. They may be undermanned but their attitude and aggressive nature should keep them in games. While the team look undisciplined at times in the preseason, I expect for them to become a very disciplined team as they get more used to playing in new schemes. The 2017 Buffalo Bills may not have winning record and challenge for a playoff spot but they will be fun to watch and give the fans strong hope for the future. In another year I think this team will be able to challenge for a playoff spot and more. For more experienced insights from Greg, visit his authors section at Buffalo Sports Page.